Rajasthan Jail Prahari jobs vacancy Bharti. 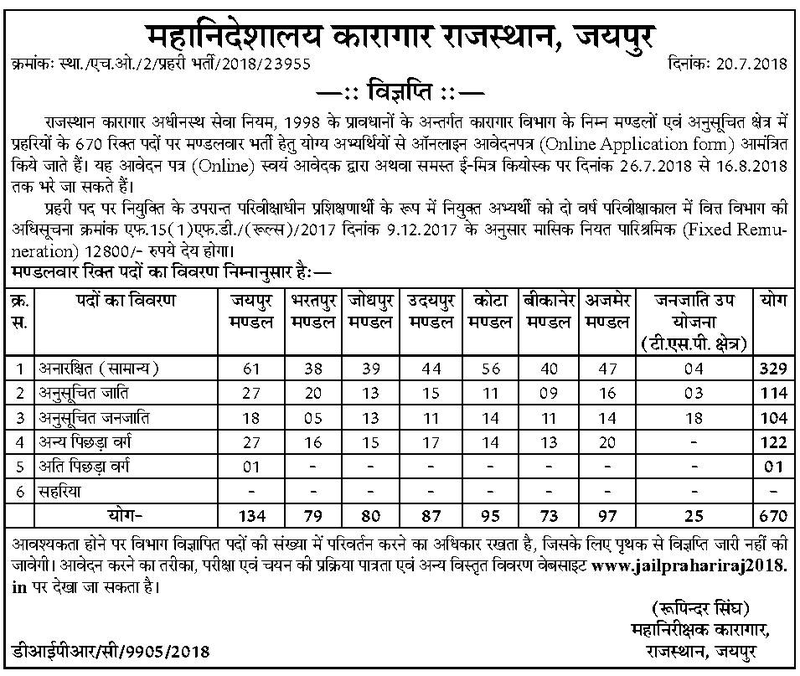 Last date to apply online for these Rajasthan Jail Prahari jobs is 16-08-2018. Online applications only accepted for this Rajasthan Jail Prahari Jobs through www.jailprahariraj2018.in website. Written Exam, Physical tests and documents verification will be conducted for this Rajasthan Jail Prahari Jobs Bharti 2018. 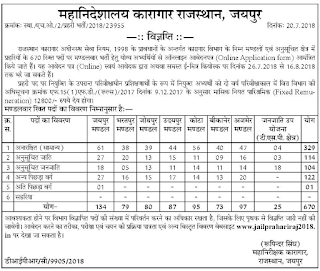 Exam Pattern, Exam Syllabus, PST/PET Physical Tests details, eligibility criteria, salary, online application process and other details for this Rajasthan Jail Prahari Jobs Bharti 2018 Notification is updated below. There are total 670 Prahari (Jail Guard) posts in this Rajasthan Jail Department Bharti 2018. Candidates must have qualified 10th class or Madhyamik for applying these Jail Prahari (Jail Guard) posts. Age limits are 18-40 years general candidates and for others age relaxations are applicable as per the norms. For these Jail Prahari (Jail Guard) posts written exam, physical tests and documents verification will be conducted. An objective type OMR or online test will be conducted for this Rajasthan Jail Prahari Jobs. Total 100 questions will be given and each question carries 4 marks. Download Exam Syllabus here for Raj Jail Prahari Jobs in pdf format.. Interested and 10th class qualified candidates submit application form online through www.jailprahariraj2018.in website for this Jail Guard jobs. Closing date for online form submission is 16-08-2018. Jail Guard Exam Syllabus, Jail Guard Exam date, Jail Guard admit card available date, Jail Guard physical tests details, Jail Guard result and other details are available in this website only.